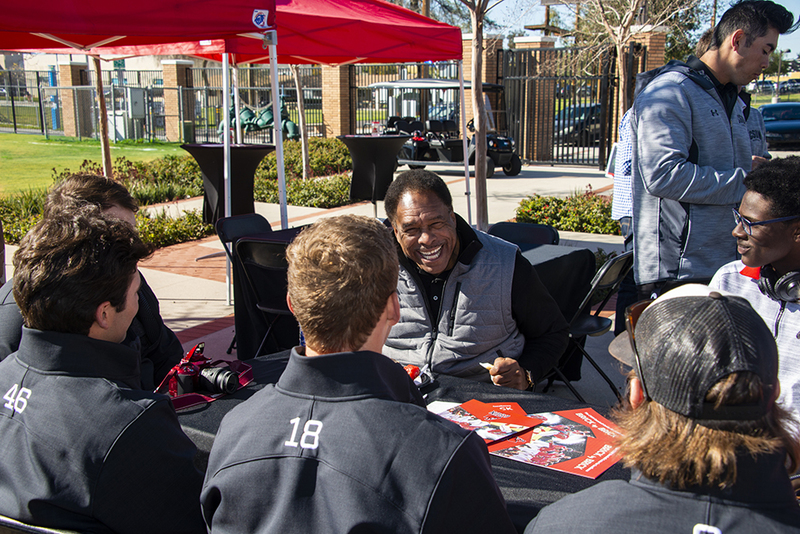 Baseball great Dave Winfield visits with members of CSUN’s baseball team as the university and Major League Baseball celebrate a $1 million grant from MLB-MLBPA Youth Development Foundation to upgrade CSUN’s baseball facilities. Photo by David J. Hawkins. The joint MLB-MLBPA Youth Development Foundation (YDF) and California State University, Northridge (CSUN) today announced a $1 million grant to upgrade the school’s facilities to help provide better opportunities for underserved young players and their families in the Greater Los Angeles and San Fernando Valley communities. The grant will go toward renovating Matador Stadium through the purchase of a lighting system, as well as supporting CSUN’s youth baseball initiative, which strives to develop baseball, leadership and life skills for kids, ages five to 17 in the San Fernando Valley. The MLB-MLBPA Youth Development Foundation is a joint initiative announced by Major League Baseball and the Major League Baseball Players Association in July 2015 to fund efforts that focus on improving the caliber, effectiveness and availability of amateur baseball and softball programs across the United States and Canada. The Foundation also aims to enhance the quality of baseball and softball education, address overall youth participation, and help youth from underserved communities strengthen their connections to the game. The YDF grant will allow CSUN Baseball to host night practices and games in an effort to create a more family-friendly atmosphere and a greater sense of community. The stadium lighting project will make it easier for high school prospects to visit CSUN games more frequently. Through expanded field availability, the grant also will support CSUN’s youth baseball initiative that serves diverse and underserved San Fernando Valley communities. 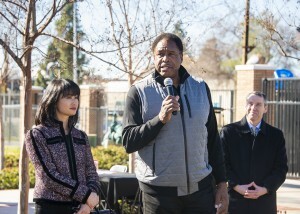 Hall of Fame player Dave Winfield, who serves as a special advisor to MLBPA Executive Director Tony Clark, played an instrumental role in bringing the school and the YDF programs together to collaborate on the project. For many of the 1.8 million residents of the San Fernando Valley, baseball is increasingly financially inaccessible to underserved communities. According to a national poll from the University of Michigan, nearly one in five parents of lower-income families reported that the cost of participation forced their children to cut back on sports. Since CSUN Athletics implemented its youth baseball program five years ago, it has reached more than 2,500 players and families in the Valley and Los Angeles with its baseball skills, college prep and life skills training.